Every day, men and women alike struggle with the frustrations of hair removal. We all have hair somewhere we don’t want it. The summertime adds extra attention to the bikini area for women and the chest and back for men, because we cover up less. Rather than suffering through an endless rotation of razors or painful waxing sessions, more and more people are choosing to laser hair removal. 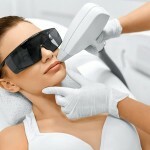 Laser hair removal uses laser light energy to treat the hair follicles that create hair. As the pigment absorbs that light, the hair follicle is irreversibly destroyed and unable to grow back. This process is FDA-approved for permanent hair reduction, meaning that hairless skin will last years in a considerably reduced manner. Call 813-778-0045 to schedule an appointment today. Today’s society places great pressure on women to achieve smooth skin, but that accomplishment is easier said than done. Though waxing and shaving are inefficient means to maintain silky skin, laser hair removal can fix that problem. Laser hair removal at Tampa Laser Hair Removal can be customized to handle even the most sensitive parts of a woman’s body. From the arms and legs to underarms, bikini area, and upper lip, laser hair removal can eliminate all hair to achieve radiant skin. Common hair removal options like shaving and waxing are challenging for men, because they usually have thicker hair that is more susceptible to razor burn, ingrown hairs, and rough patches. It only takes a few laser hair removal treatments at Tampa Laser Hair Removal for men to thin out common areas of stubble and untamed hair. Larger areas like the chest and back can also be treated with laser hair removal so lounging on the beach is no longer an event to dread. Read more about hair removal for men here. Sensitive skin on the face shouldn’t be forced to undergo shaving, tweezing, chemical creams, and other treatments likely to cause irritation and inflammation. Red bumps, razor burn, and ingrown hairs don’t need to interrupt the grooming process when laser hair removal is used on the face. The services at our laser hair removal medical clinic help to create beautiful and smooth facial skin that looks completely natural. No more razor burn, no more unsightly ingrown hairs! Read more about hair removal for the face here. Men and women both crave smooth, flawless skin that can bolster confidence and last a long time without constant upkeep. That is why at Tampa Laser Hair Removal, we offer laser hair removal for all areas of the body. The chest, back, abdomen, underarms, bikini area, arms, and legs are the most popular areas that men and women target to finally achieve truly smooth, silky skin. The treatments are efficient, safe, and provide enviable results. Read more about body laser hair removal here. A dangerous combination of environmental toxins, UV exposure, and reduced collagen production all culminate to damage the skin and prematurely age the face. Intense Pulsed Light (IPL) is a laser treatment that uses the laser’s light energy to revitalize and heal damaged and aged skin. We are excited to offer IPL at Tampa Laser Hair Removal with our state-of-the-art laser technology. Using about three to five treatments over the course of so many months, IPL’s photo-rejuvenation process restores the skin’s health and vibrancy. Read more about our Intense Pulsed Light machine here.